Melissa Lau and Matthew Simon take measurements at Imnaviat Creek, Alaska. Photo by Jeremy May. The goal of this expedition is to understand arctic terrestrial change by monitoring vegetation communities in northern Alaska associated with the International Tundra Experiment Arctic Observatory Network (ITEX-AON). The team will study environmental variability and increased temperature on tundra plant phenology, growth, species composition and ecosystem function. The ITEX network works collaboratively to study changes in tundra plant and ecosystem responses to experimental warming. The network monitoring sites are located across many major ecosystems of the Arctic. This project will provide urgently needed data critical to understanding the impact of multi-scale vegetation change on ecosystem function, namely land-atmosphere carbon and water fluxes and energy balance. Colorful tundra with Toolik Field Station, Alaska in the distance. Photo by Nell Kemp. From Fairbanks, Alaska the team will embark on an eight hour drive to Toolik Field Station, located in the northern foothills of the Brooks Range in northern Alaska. Toolik Field Station is operated by the Institute of Arctic Biology at the University of Alaska Fairbanks and has hosted hundreds of researchers and students every year since 1975. 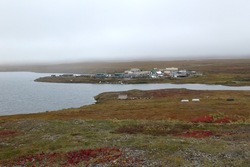 The team's research sites around the Toolik Lake area are accessed by walking on approximately 1.5 km of boardwalk. They also use a truck for daily visits to Imnavait Creek, North Slope, Alaska. Mrs.Martinez would you go again to Alaska to visit again.